All businesses manage risk. As risk continues to evolve in the domains of cybersecurity, catastrophe, terrorism, environmental, and more, the solutions necessary must also become more creative. Currently, four professionals retire for each worker that enters the industry, so there is a huge need for new, diverse talent across the globe. Since 2014, the University of Colorado – Denver Business School’s Risk Management and Insurance (RMI) program has offered a unique Global Risk Management course to develop the next generation’s expertise to understand and contribute to challenging risk solutions. This past May, 18 students participated in the two-week intensive Maymester course at the CU Denver Business School, learning from professors and industry experts. 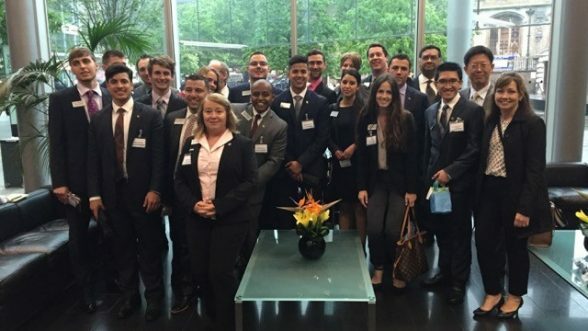 For the third week, they traveled to London to gain an in-depth understanding of many of the world’s largest insurers and reinsurers in London’s Financial District. Rob Moran, BSBA Risk Management and Insurance, BSBA Finance. RMI students under the famous Lutine Bell. It is located in the center of Lloyd’s building in the underwriting room and rung after a big deal was closed. 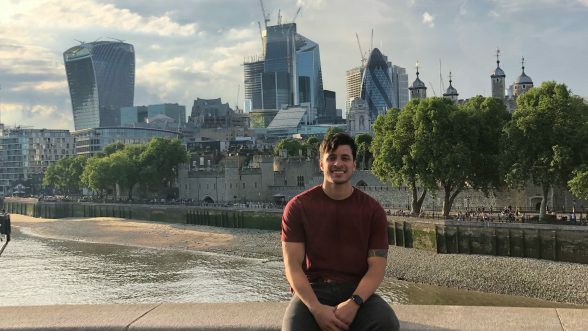 As part of the London cohort, Moran benefitted from the sponsorship of Surplus Lines Association (SLA) of Colorado, a financial and intellectual sponsor since the program’s inception. Together with the Business School RMI faculty, the SLA of Colorado created a unique class that explores how risk is transferred globally, with a focus on the excess and surplus lines industry. Multiple industry experts traveled to Denver to present to students, including Tim Turner (President and CEO of RT Specialty, Chicago) and Kevin Habash (Senior Vice President, Willis Towers Watson, Los Angeles). “One key message I took away from Tim’s presentation was that in this industry, specializing in a specific niche can make a person extremely valuable,” Moran said. By the end of the two weeks, Moran and his fellow students better understood the sustained growth of the excess and surplus lines industry and were better able to comprehend and articulate the scope of global risk insurance. 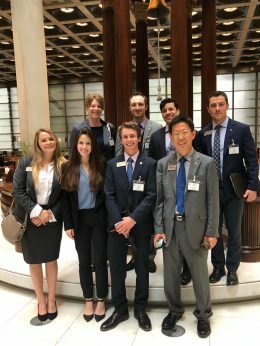 While in London, students visited and learned from UK insurance brokers, reinsurers, and top insurance companies, including AIG, Aon, Marsh, Zurich, Korean Re, and Chesterfield. Several visits stood out for Moran. Christopher Beazley, the CEO of the London Market Group (LMG), gave an insightful presentation on the London market to students and the direction they are heading. A major effort, in particular, is to attract new and diverse talent into the industry. “I believe the industry will lean heavy on the younger generations to be creative and innovative in solving new problems and finding the best solutions,” Moran explained. The RMI students at Willis Towers Watson, London. The highlight of the trip, however, was the rare opportunity to visit Lloyd’s of London. Lloyd’s is a marketplace where global underwriters, brokers, and clients meet to procure insurance for unusual risks. Students enjoyed the exclusive opportunity to sit in a syndicate “box” with talented underwriters, observing their transactions with brokers. This is an experience few in the industry are privileged to, giving students an inside view of how Lloyd’s functions. 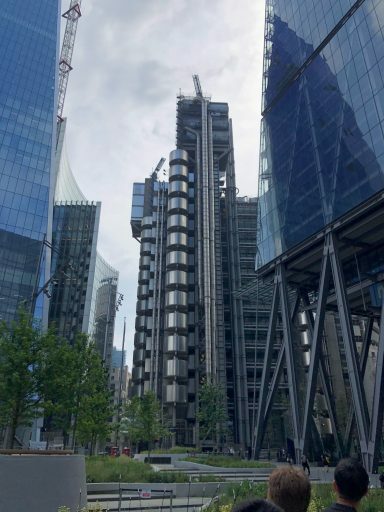 “Many professionals in this industry have never had the opportunity to sit in a box in Lloyd’s, so it was absolutely fascinating,” said Moran. For Moran, the robust and academically challenging nature of the course was incredibly valuable. It gave him the opportunity to learn about both the brokerage and carrier side of insurance and how the US and UK team up in a global setting. The exposure to executives and behind-the-scenes insight helped him prepare for his summer internship. As a wholesale excess & surplus broker intern for Arthur J. Gallagher, a $6.16 billion multinational risk management and human capital consulting firm, Moran is already applying what he learned in London.